The Summer Scholars Program provides international students with the opportunity to study in the United States and experience college life on an American campus. While participation in the Summer Scholars Program does not guarantee admission to a college or university, the successful completion of a pre-college program demonstrates the student's potential to study in English at the university level. Copy of your student visa – If you are already studying in the U.S. Applicants admitted to the Two-week Non-Credit Program do not require a student visa, however a TOEFL or IELTS score is still required for non-native English speakers. Select your first program preference and second program preference from the drop-down list on the application. If your program is not listed, select "other" and write your program in the box. Some new programs that are not included in the drop-down list are: Explorations in Architecture and Global Business. High school registrars can send transcripts by email to: ssp.docs@miami.edu. Send a copy of the ID page of your passport to ssp.docs@miami.edu. All applicants (applying for the Two-Week Non-Credit or the Three-Week Credit Programs) whose native language is not English are required to submit official results of the Test of English as a Foreign Language (TOEFL) or the International English Language Testing System (IELTS). International students demonstrate a proficiency in English by submitting the TOEFL exam, with an Official TOEFL score report of 213 for the computer-based test, 550 for the paper test, or 80 for the internet-based test (including the speaking sub-score); or by submitting the IELTS score report with a minimum score of 6.5. UM does not accept the Institutional Testing Program (ITP) TOEFL score report. For information visit the University's English Proficiency Requirements page. An F-1 student visa is required for non-U.S. citizens* applying to the Three-Week Credit program. If you are already studying in the U.S., email a copy of your student visa and I-20 to ssp.docs@miami.edu. Email your scores to ssp.docs@miami.edu. * Applicants admitted to the Two-week Non-Credit Program do not require a student visa, however a TOEFL or IELTS score is still required for non-native English speakers. 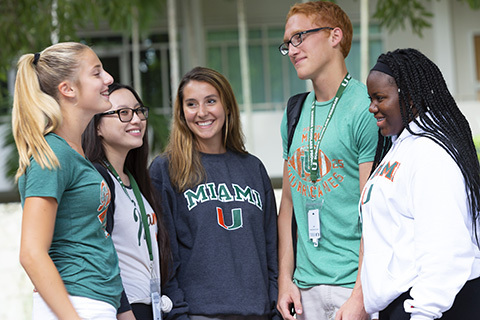 If you require an F-1 student visa (non-U.S. citizens applying to the Three-Week Credit Program), you will need to submit a bank letter on official letterhead stating that the person responsible for your living and personal expenses while studying at the University of Miami has a minimum of $8,500 in his/her account, or a recent bank statement showing a balance of $8,500. Send your financial letter of support to ssp.docs@miami.edu.